A wild boar in Sweden found himself in quite the predicament when he wandered out onto a frozen lake — and got stuck. The boar was attempting to escape from a small island in the middle of the lake, where he was likely running out of food. Unable to swim across, he tried to walk but kept slipping, and ended up entirely stuck. Luckily, a group of skaters who were out curling spotted the little guy and knew they needed to help. 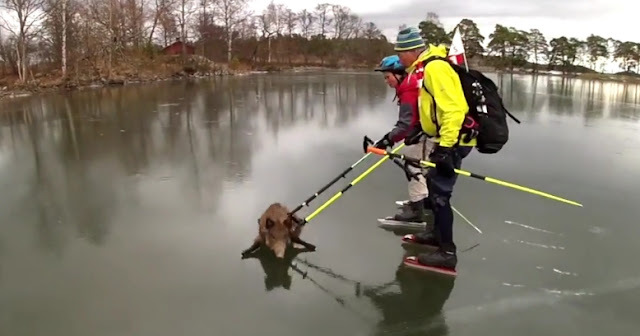 If the skaters hadn't stepped up to help, the boar may never have made it on his own. It just goes to show that a little bit of kindness can go a very long way. Wild boar are shy creatures and rarely seen in daylight. Dusk and dawn offer the best chances to see them. After two hundred years of absence the Wild Boar has made a return into the Swedish nature. The species has a long history in Sweden which began more than 8,000 years ago. Boars are omnivorous, but most of the feed (about 90%) consisting of vegetables. Although it primarily feeds on fruits, seeds and roots, the Wild Boar eats a wide range of foods including some animal matter and scavanging from the Wolves’ leftovers. Wild boars usually live in groups of between 6 and 20 individuals, although larger herds have been seen. Responses to "Skaters Found Him Struggling On Frozen Lake And Knew They Had To Help"